In most churches, a significant proportion of the budget is assigned to ensure the preaching pastor has sufficient time and resources to prepare sermons. On average, it takes around twenty hours to prepare an expository sermon. When it is a difficult passage or topic, that time allotment increases. Now twenty hours is a big chunk of the pastor’s week, and yet we are prepared to free him up for that commitment, because we believe the sermon is one of the most important weekly activities we undertake. But is our commitment to pastoral-preparation matched by our own congregational preparation? I’m not saying that every parishioner should give twenty hours a week to prepare to listen to a sermon, but there should be some preparation in order to listen well. We are told men ought not to preach without preparation. 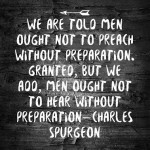 Granted, but we add, men ought not to hear without preparation. Which, do you think, needs the most preparation, the sower or the ground? I would have the sower come with clean hands, but I would have the ground well-plowed and harrowed, well-turned over, and the clods broken before the seed comes in. It seems to me that there is more preparation needed by the ground than by the sower, more by the hearer than by the preacher. Of course, we are not downplaying the effort required from the preacher, but we listeners should consider our efforts too. This week, I’ll present four pre-sermon spiritual preparations, and then next week, five physical preparations. Here we go with the spiritual preparations . . . Throughout the week, we should daily be confessing sin (1 John 1:8–10). This is especially important as we approach the sermon event. It will be impossible to listen enthusiastically to God if we are harboring sin in our hearts. In 1 Peter 2:1–3, we are commanded to thirst for the pure milk of the Word, but a prerequisite is listed in that passage—namely, if we do not first put aside “all malice and all guile and hypocrisy and envy and all slander” then we will not be able to develop that insatiable, baby-like appetite for the pure milk of the Word. So our first spiritual preparation is to ensure that unconfessed sin is brought into the open. We are to spend time with God in prayer, acknowledging the specific sin, seeking His forgiveness, pleading for a pure heart, and making a commitment to live righteously. If your sin has affected others, you will need to go seek their forgiveness also. Don’t wait until Sunday to do this. Take it seriously, and deal with personal sin as soon as it is brought to your attention. Second, look up next Sunday’s Bible passage and read it at home during the week. Get your family involved in the process. Meditate on the passage during your quiet time. Write down questions that arise from the text. Fill your mind with the passage, so that when you listen to the sermon you will have a head-start and will already know where the sermon is going. You will be more engaged and your heart will already have been challenged with the spiritual truths that passage contains. Third, pray for next Sunday’s preacher in the middle of the week. His job is difficult and his responsibility is weighty. Ask a preacher what he wants from his congregation, and most will answer this way: “Please pray for me” (1 Thess 5:25; 2 Thess 3:1; Heb 13:18). So ask the Lord to give your pastor grace and wisdom, strength and clarity in his study, so that when he comes to deliver the Lord’s message, he will come with humility and confidence, truth and grace, and integrity and knowledge. Fourth, pray often for yourself, that God will grow in you a heartfelt expectation of all that will take place in your mind and heart during the sermon experience. Cultivate humility by anticipating spiritual change. Expect God to speak. Expect Him to assault your earthly hangovers. As you walk into church on Sunday morning, deliberately quiet your mind and heart before the sermon and say to yourself: “This is when God speaks to me.” Pray: “Lord, speak to me. I am listening.” Pray for the work of God’s Spirit to enable you to submit to what the Bible clearly says, and to help you to change. These four spiritual preparations will be aided greatly by the five practical preparations I’ll post next week. Charles. H. Spurgeon, Spurgeon at His Best: Over 2200 Striking Quotations from the World’s Most Exhaustive and Widely-Read Sermon Series, ed. by Tom Carter (Grand Rapids: Baker Books, 1988), 158. The following preparation suggestions come from the following helpful books:Thabiti M. Anyabwile, What Is a Healthy Church Member? (Wheaton, IL: Crossway Books, 2008), 22, 25; Christopher Ash, Listen Up! : A Practical Guide to Listening to Sermons (New Maiden, Surrey, England: The Good Book Company, 2009), 5; Joshua Harris, Stop Dating the Church (Sisters, OR: Multnomah Publishers, 2004), 105; and Ken Ramey, Expository Listening (The Woodlands, TX: Kress Biblical Resources, 2010), 112–13.